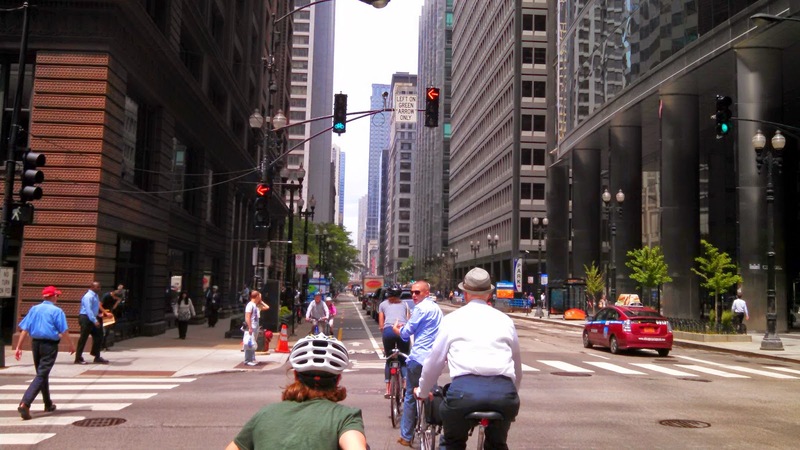 The two way cycletracks have required a lot of bicycle signals to be added on the downtown streets of Chicago. There were a variety of types but there were certainly common themes. The first was the lack of detection for the bike signal because it is operated with the pedestrian crossing. The left turn is operated without detection, so that is wasted time if there is low demand (at night for instance). There were some cases where leading pedestrian intervals were installed and I noticed some people on bicycles using the added time. The contraflow provides good sight distance at the intersection and signal heads in the opposite direction are to the right of the cyclist. Most often they were on the poles that were both nearside and farside, so it could be that the modifications to the signal were very limited based on the layout they chose. The placement of signal heads varies and I asked about this. The first example we came across is shown in the picture at the right. The left turn indications are on the end of the mast arm and on the pole, whereas the bicycle signal is directly over the lane in between the two left turn arrow indications. Chicago staff indicated they wouldn't do it again like this, but the engineering team wanted a redundant second signal head for the left turn. The bicycle signal farside is supported with an auxiliary nearside signal head. This is the lowest cost application for the bicycle signal displays, so this design appeals to me on certain levels, but it is inconsistent with the signal to the right of the cyclist model that is common in Europe. 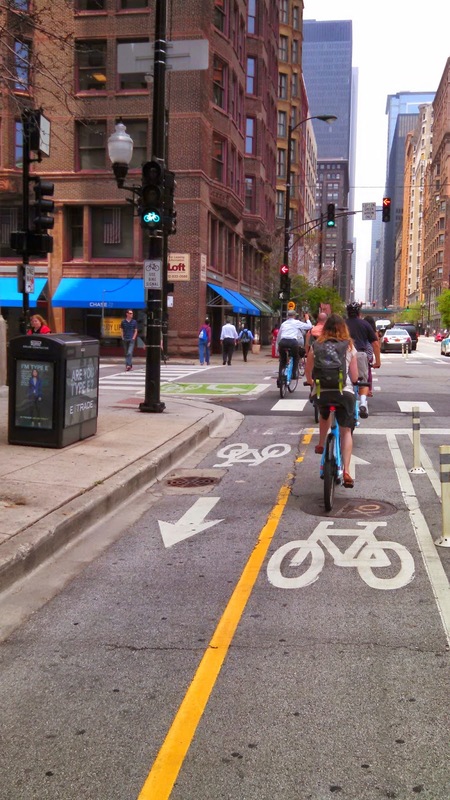 In the case of Chicago's cycletrack in the same direction of motor vehicle traffic, this is as good as it gets given that it is unlikely a signal pole in the 18" buffer would last long with turning vehicles. 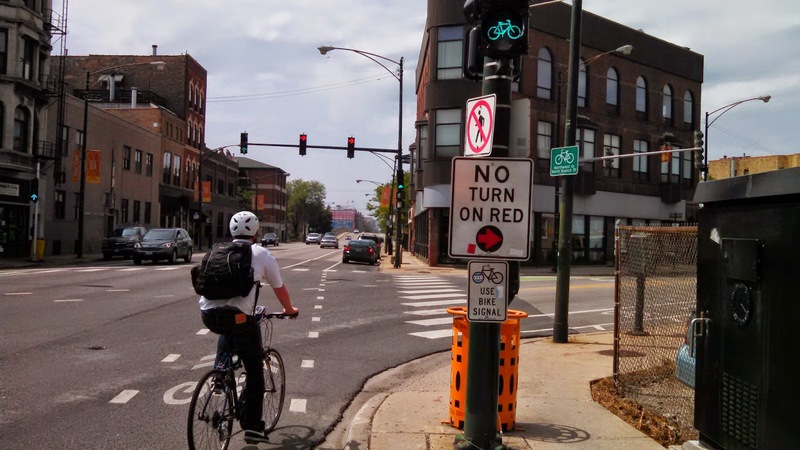 The last picture shows the newer design with left turn signal heads to the left of the bicycle signal displays. This is also the point where the cycletrack ends and the curb becomes parking with a bike lane to the left of the through traffic. 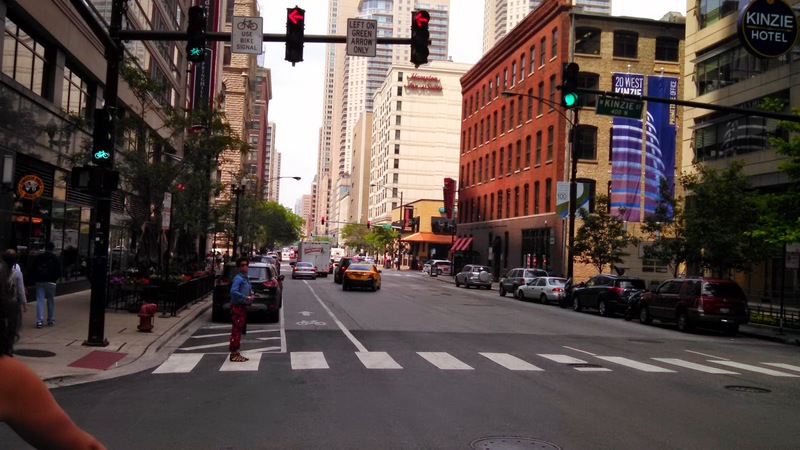 This particular intersection is North Dearborn at W Kinzie. The signal design was completed with relatively low cost and seems to work really well with only a few additional signs on the mast arm. They don't use any (that I saw) part time right turn restrictions signs, but I did see some no turn on red associated with bike boxes. Examples of the No Turn On Red signs varied based on whether there was an arrow in the signal head (below) or it was a circular red indication. Horrors! 12" Near side bike signals? Many people don't know where they can get some design able sign. Bokay providing the quality sign. They are so much humble to their customer. They also provide a cheap rate of good digital signage with the best quality. I also make a custom size sign for my business purpose. You can also make some custom size Traffic sign.